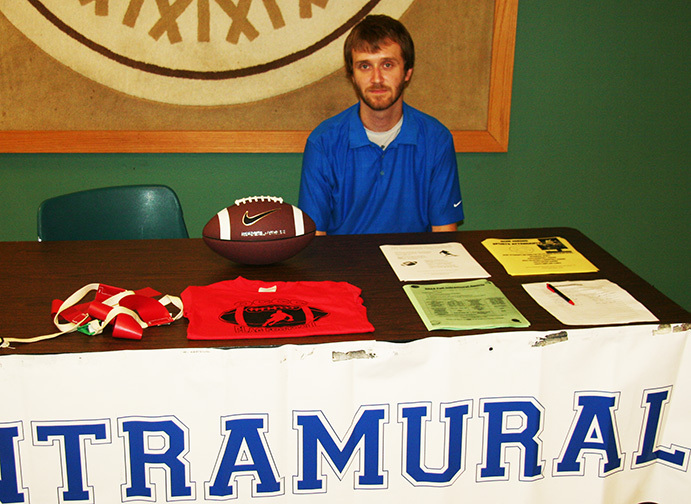 Students interested in playing in a flag football tournament in Arkansas at the end of the season and also participate in intramural football on campus should sign up for the football club, said Matthew Wright, intramural sports assistant. Sign-up deadline is Sept. 25. “We are looking for 10 or 11 students … ,” he said. Wright said the flag football club is for students only who are enrolled in six or more credit hours. The club fee is $25 and covers tournament costs. Students can register at www.imleagues.com/OCCC. Wright said the students in the football club also will play with the intramural flag football league on campus. The league will play by NIRSA rules, he said. Games will be played on Wednesdays starting at 4 p.m. and ending by 7 p.m.
Wright said the tournament is held each year at the University of Arkansas in Fayetteville. He said this year’s tournament will be held from Friday, Oct. 25 through Sunday, Oct. 27. “Transportation will be provided to and from Arkansas,” Wright said. However, he said, lodging costs are up to the individual. Wright said the team will be staying in a hotel somewhere near the university. “Last year four of the guys split a room which cost around $60 for the three days they were there,” he said. He said students also would need to pay for their own food. Political Science major Krewn Garrett said he started playing last year. “I joined because I wanted to keep my skills up and when I transfer, I want to walk on … to the University of Central Oklahoma or Northeastern State University,” Garrett said. Garrett said he played wide receiver last year. He said his favorite part of the season was going up to Arkansas to play in the tournament. For more information, visit the Recreation and Fitness office located on the first floor of the Main Building or contact Wright at 405-682-7860.